River Studios offer singing lessons for all experiences, from those just starting to professional singers. Prices start from £16 for 30 minute sessions leading to £32 and £36 per hour. 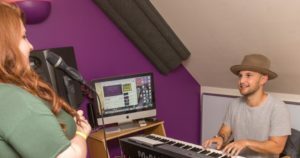 Providing first class vocal tuition to a wide range of pupils at our studio in Southampton, Hampshire. We take pride in being one of the best vocal schools in the UK. We have 4 private voice coaches who offer singing lessons for all levels of ability for children from the age of 6, right through to professional singers. A diverse range of styles is catered for, using innovative coaching methods that have been tried and tested on over 120 Grammy Award winning artists. The technique is a proven safe method that has instant results. We offer individual dedicated teaching rooms, fully equipped, designed to be a space that can help you relax and enjoy your vocal workout. They are all internet ready enabling us to source music and backing at the touch of a button. They all have mics and PA’s so that your coach can help you work on your performance as well as your vocal delivery. What can you expect from your first lesson? A warm welcome from both our reception staff and your coach, who will collect you personally from our comfy waiting area. Your vocal coach will then walk you through your first lesson, they will do a vocal assessment with you and get straight to work on improving your technique. You don’t need to bring anything with you, but an idea of a song you would like to sing is always helpful. All lessons are recorded and you will leave your lesson with a copy to help you practice and develop your skills. Call us now on 023 8065 8373 or email us on reception@riverstudios.co.uk for an introductory offer to new clients to buy one lesson and get one free! We also offer Piano lessons in Southampton, Music Theory lessons and Music productions lessons at River Studios.